Perspective: We hear a lot about the “women’s vote” these days, although most young people take universal suffrage for granted and the fight for women’s right to vote is usually given scant attention in the classroom. Since the late 20th century, women have constituted the majority of the voting public. The number of female voters has exceeded the number of male voters in every presidential election since 1964. In every presidential election since 1980 the percentage of female voters has exceeded the percentage of male voters. In this module we offer resources, information and ideas for examining the role of women in politics as voters and the history of their increased participation in the political sphere. Goal: The goal if this module is to provide resources and information about the history of women’s vote in the U.S. Looking at the women’s suffrage movement provides a framework for exploring the changing role of women in politics and society in the 19th and 20th century. The history of suffrage offers an opportunity to examine women’s roles at critical points in the nation’s history, and to think about the impact of women’s voting behavior on politics in our time. Content: We provide activities and discussion questions designed to explore the changing role of women in society and in politics. The module includes ideas for developing lessons on women’s suffrage and integrating the issue of suffrage into lessons on US history and politics, and to consider the impact of full suffrage on politics and society today. Overview of Women’s Suffrage in the U.S.
Timeline of the Women’s Suffrage Movement in the U.S.
Excerpts from Holland’s Magazine Essay Contest on Women’s Suffrage, March – May, 1913, Archives and Information Services Division, Texas State Library and Archives Commission. Sojourner Truth, “Ain’t I a Woman?” performed by Alfre Woodard. Part of a reading from Voices of a People’s History of the United States, February 1, 2007 at All Saints Church in Pasadena, CA. Why is voting important? Do your parents vote? Who should be able to vote? What do you think it would feel like to vote for the first time? How different was it to be a child in the 1890s? How were boys and girls treated and expected to behave in the 19th century? What event is considered the beginning of the women’s rights movement? How did the movement get started and what impact did it have? Why did Stanton model her Declaration of Sentiments on the Declaration of Independence? (compare and contrast documents). Which were the first states/territories to allow women to vote? Pick a state to study, when did women get the vote? Why were women successful, or not, in getting the vote before 1920? Which states allowed women’s suffrage before the 19th amendment? 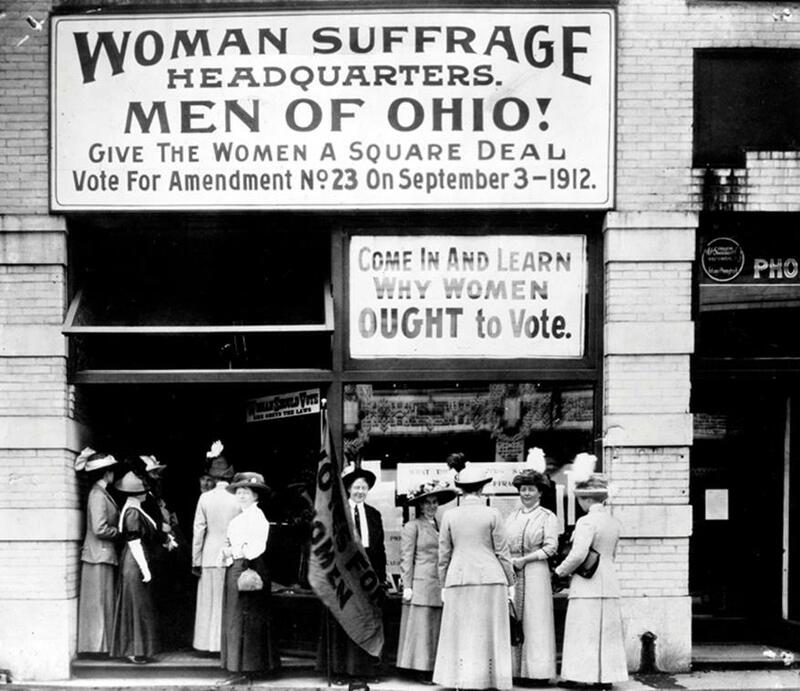 When did your state first give women the right to vote? How does that compare with neighboring states? How were black women involved in the fight for women’s suffrage? What additional challenges did they face? Why did World War I change the kind of jobs and opportunities available to women? How did the war influence the fight for suffrage? What has been the impact of women’s suffrage in the 20th century? Compare women’s suffrage in the U.S with other countries. 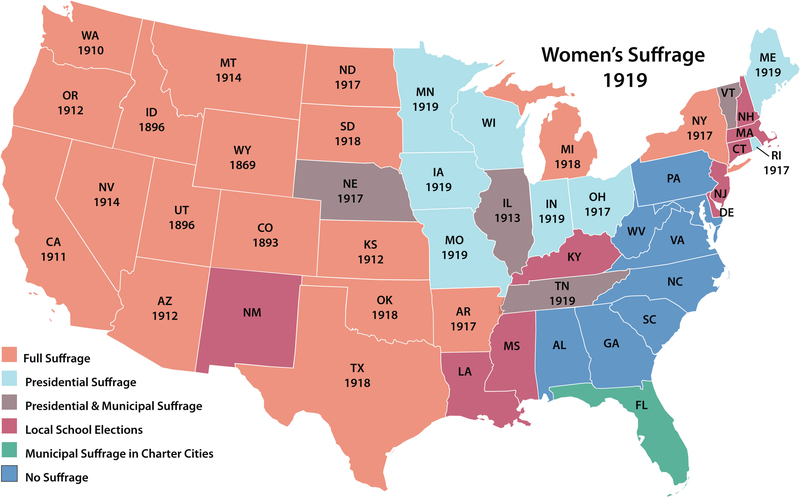 What factors help explain the success of the women’s suffrage movement in the western states, and its relative lack of success in eastern and southern states? We now take for granted universal suffrage (all U.S. Citizens over the age of 18 may vote). How was suffrage first defined in the Constitution and how has it expanded over time? Discuss the pros and cons of the state by state strategy vs. the movement for a constitutional amendment providing the right to vote. What groups were opposed to suffrage and what reasons did they give? What was the 19th century view of a woman’s role and how did this ideal of womanhood influence attitudes about suffrage? Why did President Wilson finally agree to support the 19th Amendment? What reasons did he give? What other reasons might have influenced his decision to support women’s suffrage? How does it feel to be excluded from the decision making? Why do you want to have a vote? Would the result have been different if everyone voted? Compare to actual posters. What kinds of messages/pictures would you use to persuade people? Pick a state to study – when did women in that state get to vote? Stage a protest or march for a cause in your school. Discuss how your protest/march is similar and different from those of the suffragists. How would you try to persuade people? What arguments did you come up against? Were some people more sympathetic to the cause than others? Imagine you are a suffragist urging people to sign your petition for a statewide referendum on the issue. What arguments do you mobilize to influence people to sign your petition? What counter arguments do you hear from those passing by in the street who oppose women’s suffrage? In 1913, Holland’s magazine sponsored an essay contest on the women’s suffrage. Have the students write an article in response to the magazine. What would you say about why women should have the vote?